Hullo folks! I hope October is treating you well so far. 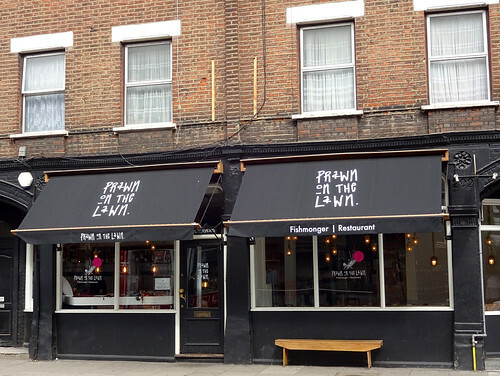 This week's featured article is for rhyming restaurant/fishmonger Prawn On The Lawn in Highbury. The fish is good and the staff haven't let the daft name affect their levels of professionalism. Newly added to RGL is Miss P's in Croydon, on the site of former Cricketer's pub (near the Lebanon Road tram stop - our team of reviewers did not mention any sightings of Phil Oakey at said tram stop but I'm sure he can't be far away). Miss P's specialises in barbecued meats and fish, and reading the article made me feel very hungry indeed. 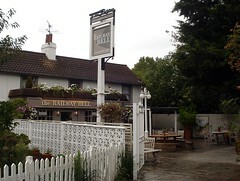 Two temporary pub closures to report: the Sugar Loaf Inn in Little Chalfont and the Lord Palmerston in Dartmouth Park are both due to reopen after some management switcheroos. 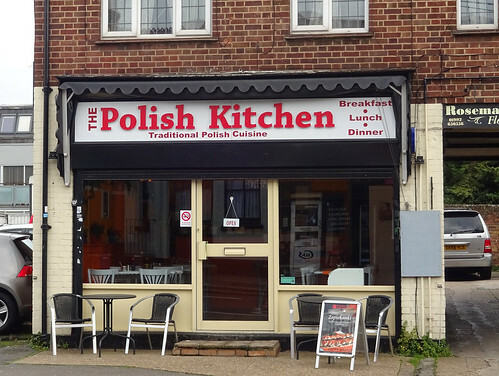 Meanwhile way up in Zone 9, Chesham's Brazil's Cafe is now a restaurant called Brazil's Kitchen. I'm sure the RGL crew will head back there at some point to see what has changed aside from the name. Finally, fancy Indian restaurant Vineet Bhatia in Chelsea has closed for good, just after getting their Michelin star back. I guess you could say it was…*puts on CSI sunglasses*... "Michelin accomplished"? Yeeeooooow! 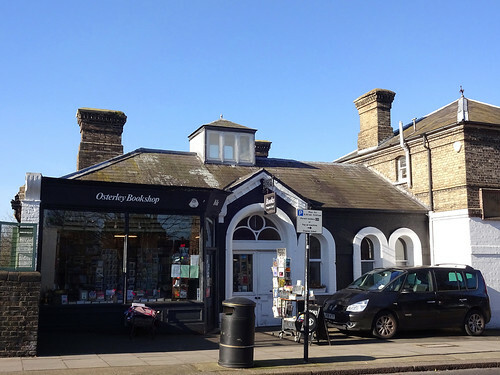 Hi all, apologies for the late post this week - I spent the weekend gallivanting all over Penge and have only just recovered. 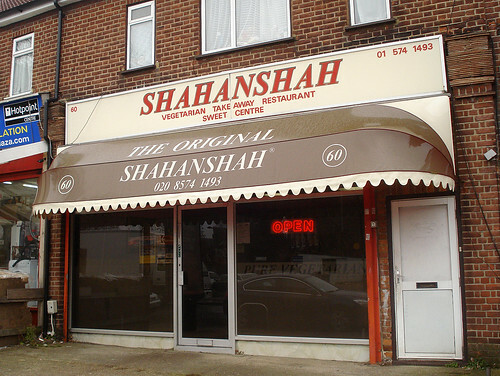 This week's featured article is for Shahanshah in Southall, a popular vegetarian Indian cafe a little way off the Uxbridge Road. 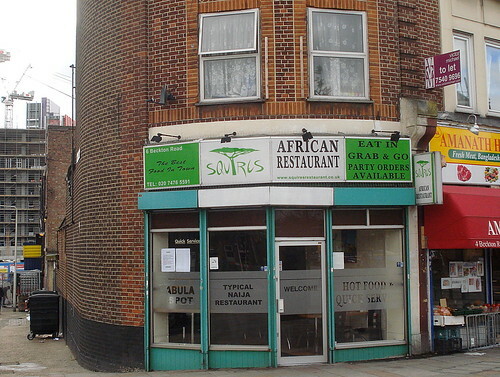 The samosas are fresh, crisp and extremely good value, as is the rest of the menu. 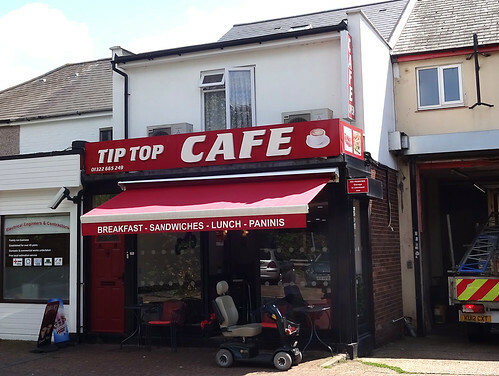 There's a new article for the Hilltop Cafe in Sydenham, a greasy spoon which opens at the crack of dawn - including on Sundays (very useful for those embarking on epic Penge adventures). It's also very cheap, but far more functional than some of its trendier competitors in the area. 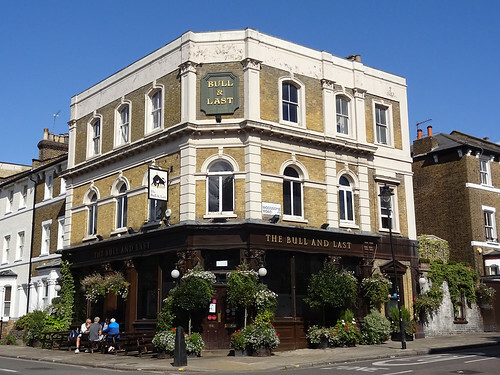 Finally, two pub closures to report: the Dartmouth Arms in Tufnell Park and the Elephant & Castle (no prizes for guessing where that was). 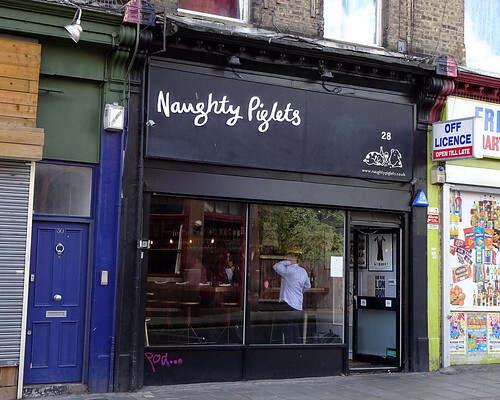 This week's featured article is Dirty Burger in Kentish Town. This tiny emporium serves the currently-trendy style of semi-posh burgers crammed full with Stuff, but also does fried breakfasts (in a burger bun) until 11am. New to RGL is Just Falafel, a small, vegetarian-only cafe/takeaway in Covent Garden. I love the menu pictures on their website, there's something very comforting about seeing different combinations of falafels, halloumi and chips photoshopped onto the same background. They even have a picture of some water in a cup in the drinks section, which you can 'share on Facebook'. Amazing. 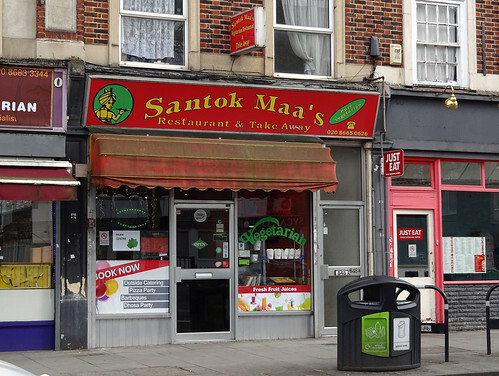 There are three closures to report this week: Speedy Noodle, a noodle bar in Brixton (now a branch of Foxtons) the Goldhawk pub on the Goldhawk Road near Shepherds Bush, and to finish off this week's theme of unimaginitively-named places, The Bar in Gants Hill is no more. 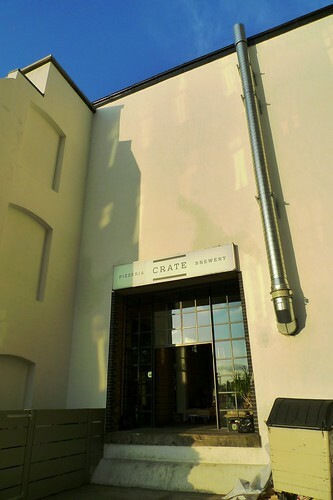 This week's featured article is Crate, E9 5EN, a microbrewery and pizzeria alongside the River Lea or Lee canal, in increasingly-trendy post-industrial Hackney Wick. The pizzas are good and the beer is decent. It was good over summer when you could sit outside on the banks of the Lea. There are two new articles this week. 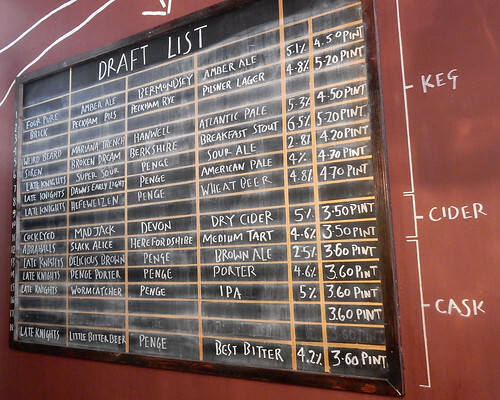 The first is for a refurbished gastropub in Kentish Town, The Grafton, well worth a visit if you're in the area, though it doesn't quite match the extensive ale selection of nearby Tapping the Admiral. 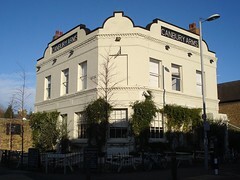 The other new entry is for chain restaurant Giraffe in Kensington, a chain known for being particularly child-friendly. 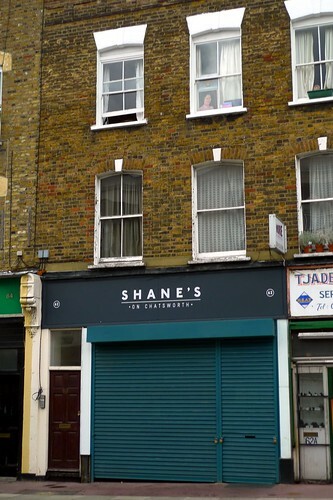 Finally, our reported closure is Dos Tias tapas restaurant in Deptford, which I think probably closed a few years ago, but nevertheless now confirmed. 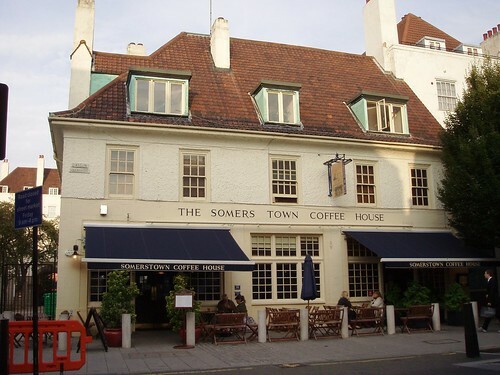 This week's featured article is the Somers Town Coffee House, NW1 1HS, which despite its name is a gastropub near Euston station. 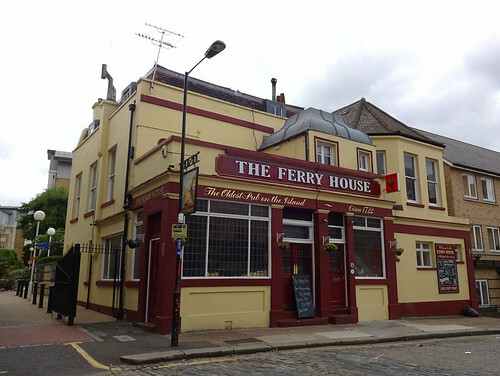 It's been refurbished since it was a French-themed pub. 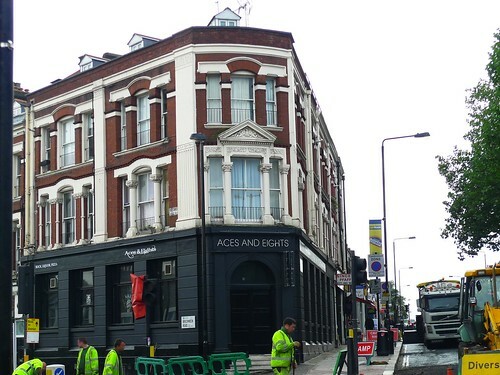 There are four additions this week: The Clapton Hart pub in Lower Clapton, another fine Antic outpost; Shane's on Chatsworth, a restaurant not too far away; The North Pole, a self-described craft beer pub in Islington; and Tramlink Route 4, a new tram route on the Tramlink in south London using some extra double-tracking (but no new stations). 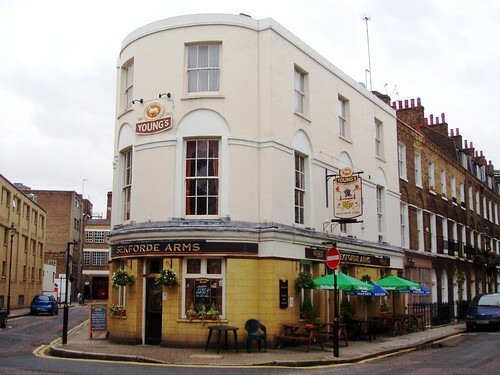 There's been an update to the stub entry for The Lord Palmerston, a Geronimo Inns gastropub in Dartmouth Park. 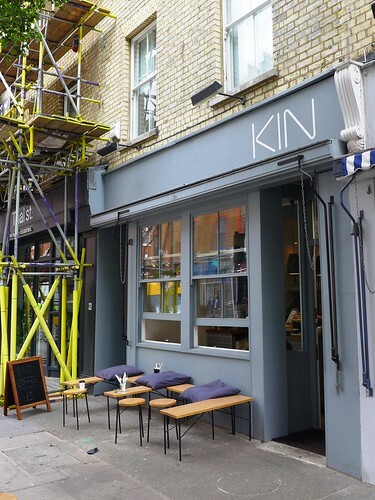 Five permanent closures have been reported: Ping Pong's branch on Goodge Street; the Texas Embassy Cantina by Trafalgar Square; Melati, a Malaysian restaurant in Soho; The Compass, a gastropub in Pentonville, at the end of Chapel Market (reopening as another gastropub called Hundred Crows Rising); and Langton's Bookshop in Twickenham. 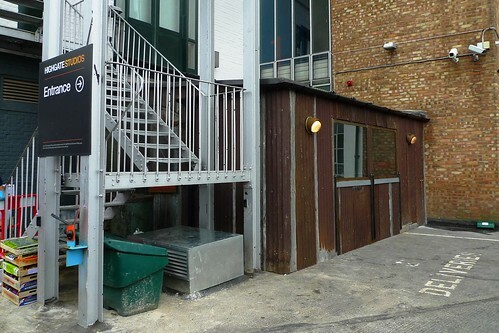 Finally, confirmation that Morgan M has fully moved from its site in Holloway to Smithfield.